Borrowing its title from a line in Pier Paolo Pasolini's poem Ma Era L'Italia Nuda E Formicolante/But It Was a Naked and Swarming Italy, Glenn Ligon’s exhibition of a new series of screen-printed paintings and neon works, of which this publication accompanies, continues his investigation of language and abstraction while referring to its Neapolitan setting. References characteristic of Ligon’s previous works, such as James Baldwin’s seminal essay Stranger in the Village, 1953, meld together with a Pier Paolo Pasolini unrealised film project and a Napoli football fans banner inscribed with the line Siete Ospiti (You Are Guests). The resulting works suggest the influence of global migration has blurred the notions of who “belongs" and who is the “guest”. The publication features a conversation between Glenn Ligon and Stephen Andrews, artist. 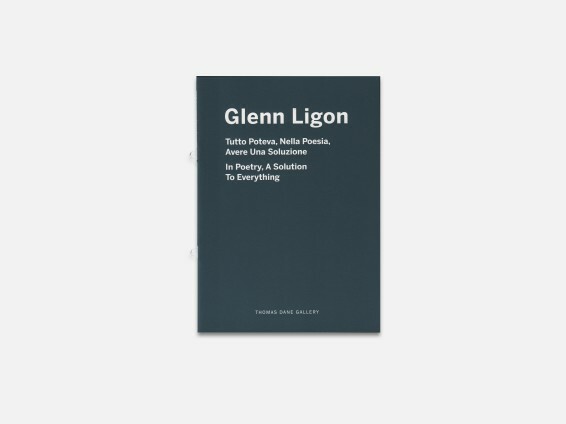 Published on the occasion of Ligon’s first solo exhibition in Italy, Glenn Ligon: Tutto Poteva, Nella Poesia, Avere Una Soluzione/ In Poetry, A Solution To Everything, at Thomas Dane Gallery, Napels, Italy (24 April - 28 July, 2018).